Mark Colbourne and Nyree Kindred won silver medals on the opening day of the London 2012 Paralympic Games. 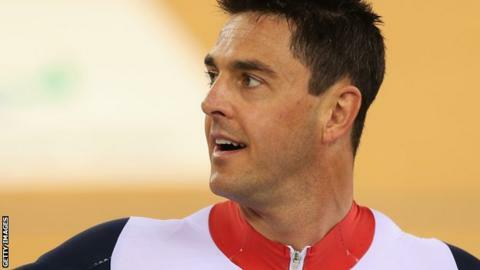 Cyclist Colbourne, 42, secured the first medal of the Games for Great Britain by finishing second in the C1-3 one kilometre sprint. Swimmer Kindred, 31, was the second Welsh competitor to grab a silver when she narrowly missed out on gold in the S6 100m backstroke. "I'm extremely happy," said Kindred, who has cerebral palsy. Colbourne, making his Paralympic Games debut, clocked a time of one minute 08.471 seconds at the velodrome. China's Li Zhang Yu won the gold with a world record time of 1:05.021, with Germany's Thomas Graf winning bronze. "I've worked for the last eight months towards this," said Colbourne, who broke his back in 2009 when forced into an emergency landing after his paragliding wing collapsed. "A big thanks goes to all the coaches for getting me into the best shape possible." Another Chinese competitor and another new world record denied Kindred gold in the event she won eight years ago in Athens. Porth's Kindred, who had won nine medals in three previous Paralympics, set a Paralympic record of 1:27.96 in her heat and swam even faster in the final. But China's Dong Lu led from start to finish, clocking 1:24.71, to consign the Welsh swimmer to silver. "A personal best [1:26:23] and a silver medal, I can't ask for much more than that," said Kindred. Also in action on the first day of competition was archer Pippa Britton in the women's individual compound qualification. Britton was unable to finish in the top four to book a spot for Sunday's quarter-final, but has another qualification round on Friday. It was a disappointing day for the Newport-based athlete, who came into the Games ranked second in the world. Wales have five table tennis players among the 38-strong contingent selected in the ParalympicGB squad. Sara Head defeated Hyun Ja Choi of South Korea 3-2 in her first group game but Scott Robertson lost 3-1 to China's Ningning Cao in his opening match. Clare Strange was part of the GB team that lost 62-35 to the Netherlands in wheelchair basketball, while sitting volleyball competitors Sam Scott and James Roberts were in action as GB lost to Russia. Britain finished second in the medal table at the 2008 Games in Beijing, winning 42 golds, 29 silvers and 31 bronzes. China were top with 211 medals, of which 89 were gold. UK Sport and the British Paralympic Association have set a minimum target of 103 medals this time from at least 12 sports.